The PFF fall 2007 adventure to the lair of the giant "bigfoot" brook trout began Thursday about 12:00 PM when we loaded up Gary's Explorer and headed east to the high country with high expectations for fishing. Tony acknowledged that he was turning 29 again for umpteenth time while I was left pondering the status of old fishermen. The reverie was interupted by the weathermen who were in contentious debate over the status of past, current and future storms. But it seemed there was a break in the weather from an early season snow storm and sunny days were forecast to be in store. Hah! One thing we all learn at PFF is never believe a fisherman about the size of the fish and never, never believe weathermen about the track of a storm. But with two of us experienced, wilderness souls, the pull of our fly rods and visions of monster brook trout outweighed any logical reasoning and we were off to seek our fame, fortune and luck with the notorous, and wiley bigfoot brookies. After assessing the weather on Half Dome and sighting a rainbow from the setting sun on Bridalveil Falls our spirts were soaring in anticipation - and about to be challenged by uncertainity. The challenges started almost immediately. While retriving the permit from the ranger station we learned that the road past the trail head, and the place where we planned to sleep, was closed due to the previous snow storm. It was unlikely that any excess hotel rooms existed in Yosemite and any alternative paths into the destination involved 3000 ft more altitiude gain - Ugh! With a sunny forcast in the morning we took our chances at a little dirt turn out. Under the smile of lady luck the road to the trail head was open the next morning and we were off under clear, cool, skies for the long trek into the --- the place where fables are born. We arrived late in the afternoon and quickly setup camp in order to catch the evening rises. With an arsenal of various wooly buggers, each big enough to represent a large, enticing, juicy meal to the most finicky of trout we stealthly approached the lake. Carefully, with trembling fingers, the optimum choice was selected and tied onto the leader. Then tested for 101 lbs of gigantic pull. The line was carefully played out onto the water in anticipation of the first, perfect cast. With great aplumb the line was expertly lifted off the water - and back cast up twenty feet into the tallest nearby tree. Naturally, it was the only fly of that style. So after a suitable period and a few choice words of "morning" for the lost fly a new one found its way onto the leader. 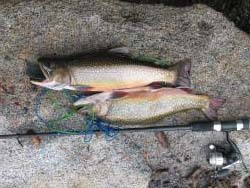 In the best of scenarios, the next cast adjacent to a sunken log connected with a nice, fat, 15" brook trout. 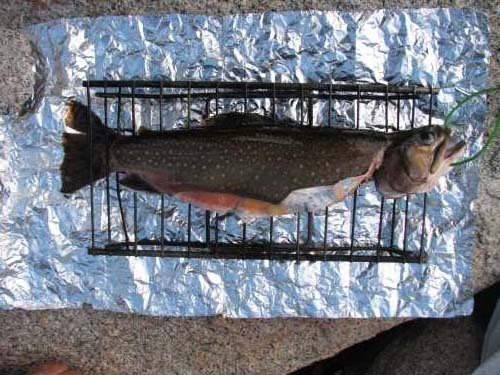 It was subsequently invited to dinner wrapped in a warm aluminum blanket filled with lemon pepper and slivered almonds. That night the snow began to fall. The snow melted when it landed on the ground, so at first the total accumulation was not great. But everything on the ground was very, very wet. So much for the sunny forcast. For the next 48 hours and the rest of the weekend it continued to drip wet, sticky snow. Finally amounting to several inches of winter white over tents, trails and trees. 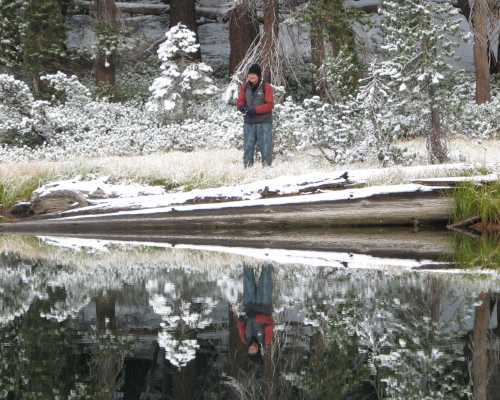 But for those dedicated searchers of TES (Trout of Enormous Size) neither rain, nor sleet, nor wet sticky snow could dampen the fever for fishing. 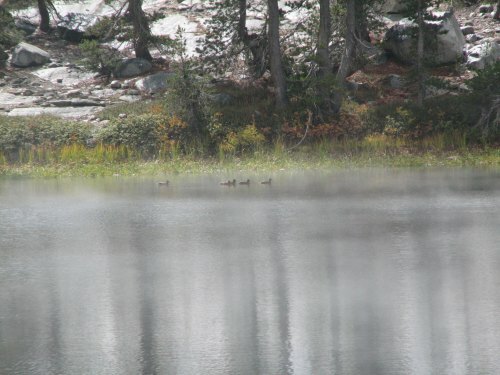 Having identified the lair of "bigfoot" brookies and how to catch them. There was no need to spend any extra time fishing, leaving plenty of time to explore the sights and sounds of other nearby lakes. Tony was able to successfully extract a few nice rainbows out of them. 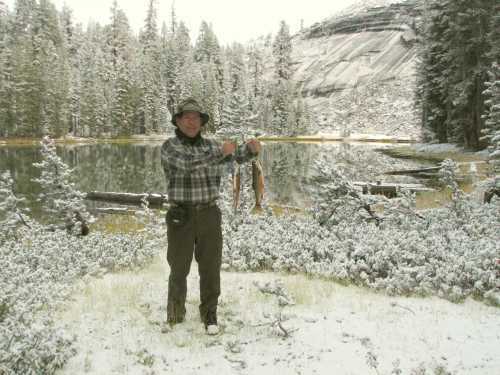 The good part about the snow was he was able to put the fish on ice (snow) for the trip to his refrigerator with no worries about melting. The bad part about the snow was Tony's sleeping bag and clothes got wet enough that they felt like a refrigerator. So, having successfully communed again with the infamous, bigfoot brookies, we left a day early for warm, dry clothes in the car. From the riot of falls colors to the sounds of ducks rising in the mists, oblivious to the wet snow, mother nature was strutting her stuff. Observing these events in the quiet of the snowy wilderness, leaves the soul refreshed, knowing that the magic of life goes on, regardless of that last memo in the office. As the PFF wilderness trips draw to a close for 2007, I leave you with one final thought. At times, when there is fresh snow on the hills and your ducks are all aligned in row, you may get a chance to teach an experience (old) fisherman new tricks. Then the adventure is renewed. Because, when you have TES on the hook, - - - life is good. Until we meet again, may your rod always point you towards bigger and better fish.